Receive an additional night free when booking your stay between 3-6 nights. Valid for selected 2018 and 2019 departures. Call us for details! Get to know the wonders of Patagonia such as the fjords, the Sierra Dorrotea, Torres del Paine, Cordillera Prat, the El Midodon Cabe and much more! *Remota Patagonia Lodge also offers longer stay itineraries and special Fly Fishing Programs. Please call us for more details. This is the perfect excursion to have an overall vision of the park. 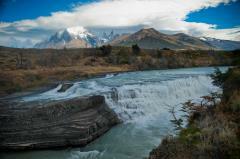 We will visit Torres del Paine from one side to the other. Will enjoy all its viewpoints like Laguna Amarga and Lago Nordenskjoldt. 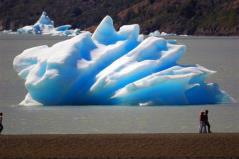 And we will do short walks to visit Salto Grande, Cuernos Viewpoint and Viewpoint of the icebergs at the beach of Grey. Lunch and all entrance fees are included. To understand how life goes by in the Provence of Ultima Esperanza (Last Hope) it is important to know the history of Puerto Natales and is inhabitants. Among other thing we will learn about how the city was built, the nature of its people as well as its traditions. We will visit different points of interest like Fishermen’s Dock, City Council’s Museum, Main Square and surrounding buildings. Guided by a ‘Gaucho’ we will ride to the top of Sierra Dorotea, where we will have magnificent views of cliffs sculptured by the glaciers and natural rock viewpoints formed by the wind constantly hitting the rock face. In this imposing landscape we will have a well deserve break to share a ‘mate’, a traditional hot beverage of Patagonia. 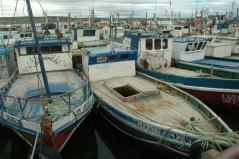 For this excursion we will depart from Remota to the town of Puerto Natales which is located 1.5km from the hotel. The circuit will take us around the fjord of Last Hope to Fisherman’s Pier, The Park of Cuatro Etnias and many other places where we would be able to observe how the locals leave, their customs and traditions. A peaceful walk through the shores of Eberhard Fjord , starting from Port Prat to Estancia Puerto Consuelo. This route was used in the XIX century by gauchos and workers of the estancia. We will explore Cueva Chica (small cave), Cueva del Medio (middle cave) and the large Cueva del Milodon (Mydodon Cave), Mylodon was an extinct genus of giant ground sloth that lived in Patagonia until roughly 10,000 years ago. This is an important natural archaeological and cultural monument as also here the earliest human remains of the region were founds (circa 6.000BC). In this excursion we will try to recreate the early settlements of Patagonia, we will get to know the rocky eaves used in the old days by the Tehuelche people. Also we will enjoy magnificent views of Lake Sofia and the valley of Sierra Señoret. This trip has been designed for those guests that wanted to know and learn the history of Last Hope and its first settlers. We will stopover at the village of Cerro Castillo where we will visit the principal section of ‘Sociedad Ganadera de Tierra del Fuego’ that was the greatest company in Patagonia for sheep farming. We will also visit the museum, stroll though its streets to see the village old buildings. Then the tour will continue to Estancia Puerto Consuelo and the hamlet of Puerto Prat o end at Puerto Bories, place where the management of Company for the Exploration of Tierra del Fuego use to live. We will depart from Remota to visit typical Chilean Patagonian Estancias, where the spirit and character of the first settlers can be felt in the shearing sheds of this faraway lands. We will also enjoy a typical Patagonian lamb roast on sticks..
Forty-five minutes from Remota we arrive to Tres Pasos Valley, place with a unique history. In front of Lake Figueroa we find the old trail used by cattle rustlers to steal livestock from Chile to Argentina and vice-versa. We will start going deep through Chorrillo Picana stream until the access point to Sierra Krüger to reach the highest point of this area. Apart from the beautiful landscape we will be able to observe many birds like condor, eagles and many other species of the forests. This crossing will emulate the one made by Spanish skipper Juan Ladilleros in 1557, when as a last hope of finding the Magellan Strait he came across with the glaciers of Balmaceda Mount. We will depart from Puerto Natales, sailing for 3 hours through the fjord toward Barmaceda Mount, located with the Bernardo O’higgins National Park, the biggest in our country. We will dock at the national park, disembark to do a short walk to see the Serrano glacier. On our return we will visit a “Estancia” to enjoy a typical Patagonian lamb barbeque. Departing to Torres del Paine National Parl though Serrano route, we will visit the viewpoints of Lago del Toro, Los Cuernos and Grey Glacier to continue toward the Grey Lake where we will do a navigation of 3 hours to the Glacier with the same name. We will be surrounded by an unrivalled landscape of floating icebergs, luxuriant vegetation and majestic mountains. You will be able to appreciate at a very short distance all the beauty and magnitude of the glacier with ice walls with more than 20 meter high. Photographic safari through Torres del Paine We will concentrate our tour on the eastern side of the park where most of the animals can be found. We will start at Laguna Azul (Blue Lake), place where the first tourist expedition to the area took place in which Lady Florence Dixie participated. The lagoon is one of the best places to see the Torres. From here we will continue to Paine waterfall and then a leisurely walk of 3 hours where we would be in close contact with wildlife specially guanaco of the Pampa. We will then visit a rocky refuge where old indigenous cave paintings can be found. We leave Remota to head south of Ultima Esperanza province and enter into "Los Rebaños" estancia after 45 minutes of driving. Once there, you can choose with the guide different paths and interior dirt roads of the estancia that take us through ancient forests of lenga and other species full of birds during summer and spring season. Seeing the forest and the life of a place from a different point of view is one of the advantages of this excursion. Climbing to the top of a wall with the support of professional guides and being able to observe valleys, forests, lakes, mountains and glaciers from the top of a climbing route is a unique opportunity in Patagonia. It doesn’t matter if you are not experienced in rock climbing. Our guides will lead you to the best option according to your experience. The summits of Patagoia are characterized by having technical and low altitude summits compared to the rest of the country. 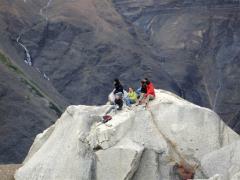 Cerro Tenerife is one of those that offers the opportunity to experience a summit in the mountains of Patagonia. Mountain Guides will help you complete this challenging experience for those who feel the need to go out in Patagonia to do something beyond compare. 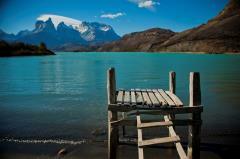 We will start with a 2 hour tour by van towards the traditional Estancia Lazo, located just in front of Paine massif. The trail is very regular, surrounded by lenga forests with a huge variety of flowers during spring and summer. We will see several lakes with different species of birds which are part of the incredible view. The trail finishes in Mirador del Toro (360º panoramic view), one of the best places to appreciate the geographic diversity of the Torres del Paine National Park. We leave Remota heading south driving through great lakes and mature lenga forests. After 45 minutes driving the van arrives to Estancia Pinto entrance from where we’ll start riding with Lake Pinto on our sight and Rotundo Mount on our backs. We will climbing gradually to the highest point from where we will have the first view of Obstruction Sound. From that point we will start going downhill crossing great Patagonian ranches (estancias) and peat-moors to finally arrive to the shore of Obstruction Sound. This program will start in Estancia Los Rebaños. We’ll descend through a beautiful and old lenga forest until we reach the shore of Lake Balmaceda. We will continue pedaling around the lake on an old cart trail, crossing streams, fences and wetlands. Towards the end we will be able to appreciate the beauty of the Patagonian Andes, and the Almirante Montt gulf. 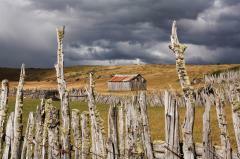 On the way to Rio Serrano, we find the Estancia Torres del Paine. From the base of Tenerife Mount we will start our walk though Coigue and Ñirre forests, trail with many waterfalls that flow towards Porteño Lake. From the highest point we will be able to see lakes Toro, Maravilla and Porteño and have a Birdseye view of Torres del Paine National Park. It is a real pleasure to go horse riding in Patagonia. Especially when we are guided by a real Gaucho (cowboy), with whom we´ll share a mate next to the fire. Sierra Dorotea is the perfect place to see cliffs sculptured by glaciers and numerous wind-whipped rock caves that serve as viewpoints from where we can appreciate the immensity of this landscape together with old country tales, estancias and steppes. We will depart Remota towards Torres del Paine National Park. Once we get to Laguna Azul we will start pedaling towards Paine waterfall, through the Macho canyon. At Paine Waterfall we will board our van which will take us to the entrance of Laguna Amarga to take our bicycles again to continue our ride through the main road, with magnificent views of the Paine Massif, riding always in between the fauna and flora permanently present in the area. 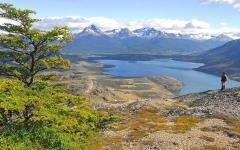 After a 1½ hrs leisurely trip by van we will arrive at Cerro Paine (Paine Mount), from where we will start hiking. To reach the Ascencio valley we will climb to the so call Paso de los Vientos (pass of the wind) to have an amazing view of the pampa, lakes, and the Ascencio river. We will retrace the valley crossing an old Lenga Forest to reach the beginning of a glacier moraine which we will start climbing step by step until we reach the Base of Las Torres. This without a doubt represents a challenge to anyone that likes hiking. After a 45 minute ride by van we will arrive at Cerro Castillo located in an old estancia called Complejo Torres del Paine, part of the Exploiting Society of Tierra del Fuego. From there we will start our challenge to try and conquer the summit of Cerro Castillo from where we will have a panoramic view of a great part of the province. One of the most challenging excursions but at the same time rewarding, of the Remota experience. It will take an hour and a half to reach the beginning of the trail. We’ll walk through old forests, meadows and shrubbery to get to the Salmon Waterfall always gaining ground through the banks of the river Pingo. The highlight of this excursion is to arrive at the impressive Pingo Waterfall, running from the glacier with the same name. Throughout the walk we will spot many birds, and will try our best to find the elusive southern deer or ‘Huemul’, native deer and sadly in the list of endangered species, that inhabits the depths of the valleys and forests of Torres del Paine National Park. Sierra Baguales owes its name to the wild horses that even today runs freely around the mountains and valleys of this place. This was an obligatory passageway for the native inhabitants of Ultima Esperanza (Last Hope). The walk will be done in areas without pre-define trails; only the expertise and knowledge of the area of our guides will take you to extraordinary geographical formations, marine fossils, shark teeth, petrified woods, and lots of new experiences in one of the most inhospitable areas of the region. We will start our walk in the area of the Natural monument of the Cueva del Milodon, we will go deep into this area and start climbing to the summit of Cerro Benitez (Benitez Mount). From the summit we will be able to see condors and eagles as well as have a panoramic view of Lake Sofia and of the Patagonian Andes. We will board catamarans Hielos Patagonicos in Pudeto. After around 30 minutes navigation on Lake Pehoe we will arrive at Paine Grande. From here we will start our hike toward the valley, surrounding Lake Skottsberg until we get to the Italian camping. The climbing to the viewpoint is sheltered by the Glacier El Frances, El Paine Grande and Los Cuernos, imposing rocky formations and the heart of Torres del Paine. We will head west towards the Torres del Paine National Park, on route we will enjoy magnificent views of Patagonian Lakes and of the Cuernos del Paine (Horns of Paine). On arrival at Lake Grey, will board a catamaran to base camp to start the highlight of the day. We will walk over the Grey Glacier, a unique experience that will allow us to have an experience in the Southern Ice Fields over ice that is thousands of years old. Our expert guides will give an induction talk, guide through the equipment and will look after us throughout the whole excursion to make it safe and enjoyable. We will head west towards the Torres del Paine National Park, on route we will enjoy magnificent views of Patagonian Lakes and of the Cuernos del Paine (Horns of Paine). On arrival at Lake Grey, we will board a catamaran to the Big Foot shelter to start kayaking. Specially trained guides will give a technical talk on health and safety and how to use the equipment. 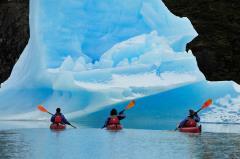 Emphasis will be given on how to navigate the kayaks around the icebergs and the glacier. After this exciting activity, we will return to the catamaran that will take you to the different faces of Grey glacier and then to our van to return to Remota. 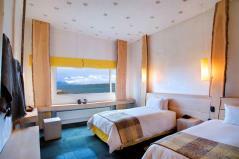 Although Remota has the highest standards of service and comfort, the hotel doesn’t define itself by stars. The concept of luxury for us is much more noble and generous as incorporates the rich environment where the property is located. All of Remota’s buildings are in perfect harmony with the environment and the local culture, from its well-recognised sustainable architecture, to the way that all the more than 30 excursions –offered daily - are restructured and created so that they cause minimum impact to the local ecosystem. Remota offers a great selection of dishes giving special attention to the different tastes and requirements that our guests may have, giving special preference to local produce like fresh seafood and fish, as wellbles as the vegeta produced in our own greenhouses. Good food requires good company, and for this purpose there is a very good wine list. Our homemade breads and deserts are not to be missed…. Remota is a hotel with very low environmental impact, built with locally sourced materials using only local workers and paying special attention to the use of green renewable energies. 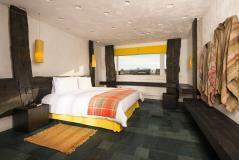 The Hotel follows strict rules for the protection of the environment, local cultures and practices. As part of its commitment with the local community, Remota aims to employ and train only local people. Daily transfers from El Calafate from 9am to 2pm. *For the Soft Program, you will have the choice of either one full day or two half day excursions in the Soft Program, while the Adventure Program offers either one full day or two half day excursions in both Soft & Adventure Programs. **There are no minimum stay at Remota Patagonia Lodge, however, from December 20th to January 3rd every year, a minimum of 3 nights is required. ***For the Adventure Program, one child up to 9 years of age is allowed to share a room with his/her parents, free of charge. An extra bed will be provided.